CD335, also known as NKp46, is a 46-kDa transmembrane glycoprotein which is a NK-specific triggering receptor involved in non-MHC-restricted natural cytotoxicity and considered the prototype of the NK natural cytotoxicity receptors (NCRs). Its expression is restricted to all resting and activated NK cells, including the minor CD3–CD56brightCD16– subset. 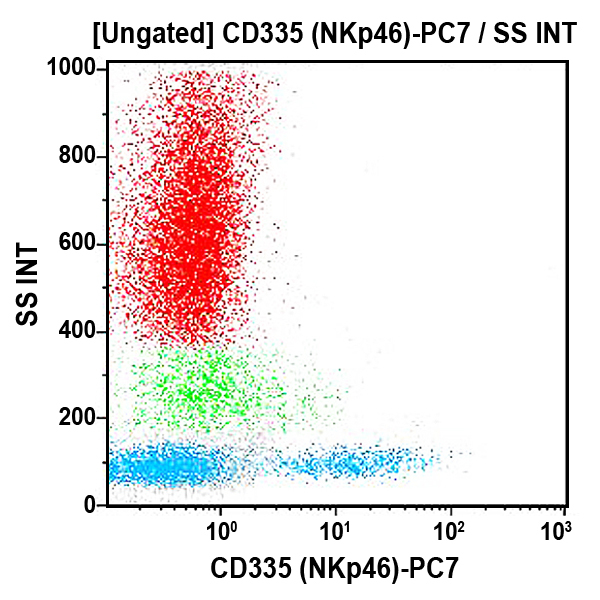 Although CD335 is highly expressed at the NK-cell surface in the majority of donors, some individuals have a proportion of NK cell (which vary up to 90%) expressing a “dull” NKp46 phenotype. CD335 is a member of the immunoglobulin superfamily characterized by two extracellular C2-type Ig-like domains. It is associated with the ITAM bearing molecules CD3ζ and FcεRIγ. Although this association is likely to be essential for signal transduction via NKp46, CD3ζ is not required for NKp46 surface expression. NKp46 represents a major activating receptor and plays a central role in the lysis and clearance of HLA class I– cells. The magnitude of lysis correlates with its level of surface expression. Clone Description BAB 281-mediated masking of NKp46 molecule inhibits NK cytotoxicity versus different target cells. In redirected killing assays, BAB281 binding to NKp46 induces a strong increase of cytolytic activity. Although hemagglutinins of viral origins have been identified as ligands for NKp46 receptor, the natural (non-viral) ligand for NKp46 is unknown.